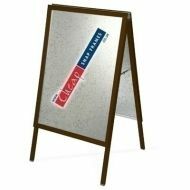 Our A-boards are in a lovely Chocolate Brown colour (RAL 8017) so can match your company colours and decor. Available in four sizes, A2, A1, 20x30 and 30x40-inches there is sure to be one to suit you. Every chocolate brown a-board has steel back panels so is robust and is supplied complete with two covers to protect your posters and keep them looking nice.